By Eric Thomas: It was shocking how heavy, slow and lethargic WBO Manny Pacquiao (54-3-2, 38 KO’s) looked in beating 39-year-old Shane Mosley (46-7-1, 39 KO’s) by a 12 round unanimous decision at the MGM Grand in Las Vegas, Nevada. If you compare Pacquiao to his performance against Miguel Cotto from only two years ago, Pacquiao looks a lot slower, less active and without the ability to jump in and out like he used to be able to do. He looked swelled up with too much speed-limiting muscle last night. 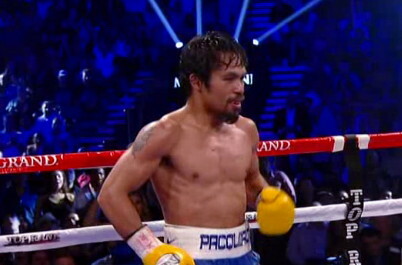 I think it was a bad idea for Pacquiao to pack on all that muscle because it doesn’t look to be benefiting him. At this point in his career, Pacquiao looks more like a slow plodding type fighter. Pacquiao needs to trim down because he’s starting to look lethargic and all that weight is making into a slow fighter. Had that been Floyd Mayweather Jr. in there last night instead of the reluctant Mosley, I think Pacquiao would have lost every round of the fight. Mayweather is a lost faster and accurate with his punches. He’d have carved Pacquiao up and made him miss all night long. As it was, the 39-year-old Mosley had Pacquiao missing with his shots and looking amateurish much of the time. And is shocking how tired and old Pacquiao looked. I don’t know if this was because his strength trainer has been putting him through too many strength building exercises or if it’s because he’s getting older. But at any rate, Pacquiao looks to have slowed down dramatically from only two years ago. If Manny keeps this up, I can’t see him still at the top in two years. No way. He’s slowing down too much and he’s become a hittable plodder. Had that been a better welterweight in there with him – someone that actually throws punches – like Victor Ortiz, Mike Jones or Andre Berto, Pacquiao would have gone through sheer agony. If you think the shots that Pacquiao took in the Antonio Margarito fight were pad, just imagine how many punches Pacquiao would get hit by the likes of Ortiz and Jones. Pacquiao is slowing down. His promoter Bob Arum needs to recognize that. The gravy train may be ending soon unless he carefully matches Pacquiao against guys that he knows he can beat. Even then, Pacquiao is going to lose sooner or later because he’s too slow and hittable now and is tiring in his fights. Right now, I think Pacquiao can still beat most of the welterweights in the division but he’ll take a beating against the better fighters. I don’t know that Pacquiao can beat Ortiz. I have my doubts. And I don’t think Pacquiao would even be competitive against Mayweather right now. Pacquiao has slowed down too much.